Non-combatant soldier reportedly suspended for shooting rubber bullet; video clips show 'murdered' rioters didn't bleed, wounds faked. The IDF has reportedly suspended a non-combat soldier who allegedly fired his weapon during the "Nakba Day" clashes two weeks ago on May 15, in which two Arab rioters died. 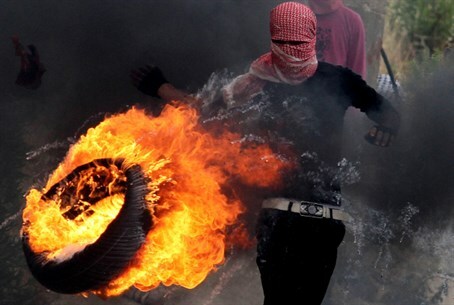 The two were taking part in a riot of roughly 150 local Arabs besieging Ofer Prison, to the north of Jerusalem, throwing rocks and burning tires at police and soldiers in an apparent demand to free jailed terrorists. Arab activists and radical leftists released a CCTV video they claimed showed the two being shot by the IDF as they walked in the area. The footage has been brushed off by the IDF as being doctored; nevertheless Foreign Minister Avigdor Liberman clarified in response to international pressure that the IDF would be holding an investigation into the event. The military police probe into footage released by CNN led to the suspension, as Haaretz reports the soldier was seen on film apparently shooting a rubber bullet around the same time the first rioter was seen collapsing. The report added there was no proof the shot killed the rioter. "The IDF has found no evidence proving that this soldier's bullet caused (Musaab) Nuwarah's death," the report added, noting that the suspended soldier was part of the communications division, a position that is not allowed to fire unless being attacked first. An IDF spokesperson refused to comment on the report to AFP, only remarking "the military police investigation is ongoing." The IDF has denied that live ammunition was used in the violent clash. The claims against the IDF on the basis of filmed footage has been showed as less than reliable by blogger Elder of Ziyon, who released some more of the CCTV that was not released initially by the leftist groups and Arab activists. In one section of the video, the two rioters are seen falling but not a drop of blood is left behind, despite the claims that they were shot by bullets that went through their bodies. In both cases the collapsed rioters are removed, and leave behind perfectly clean pavement. In another piece of the CCTV footage, a staged injury is revealed as obviously faked at the same exact area where the two supposedly were shot. In the film, a rioter hops on one foot, but apparently his false leg wound was not deemed dramatic enough, as he is ushered to the side while walking normally. The ambulance called to the scene dramatically is sent back without having any role to play. The common practice of falsifying injuries on film among Arab activists has reached the point where it has been termed "Pallywood."